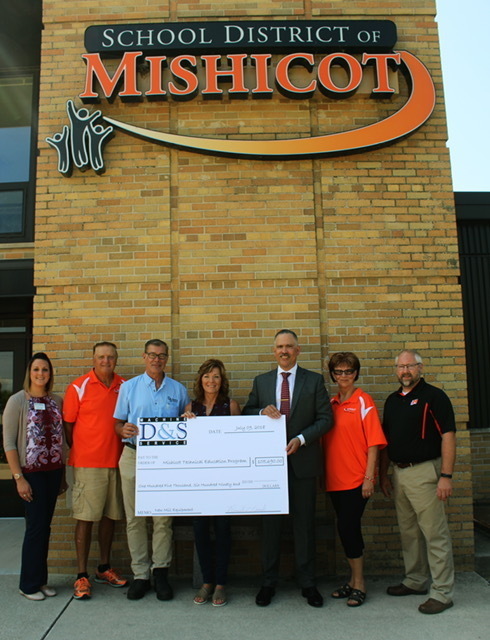 On Wednesday, August 8th at Mishicot High School, Mr. and Mrs. Russell Nowak, owners of D&S Machine Service of Luxemburg presented Mishicot High School with a donation of new milling equipment in the amount of $105,690.00. in multiple career fields including manufacturing, agriculture, healthcare, education and construction. to have this opportunity to provide more relevant educational experiences for their students. Judy Ferry - School Board, and Brennen Mickelson - Technical Education Teacher.